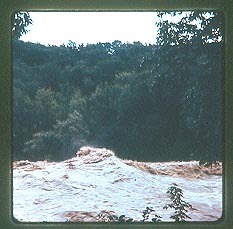 One of the greatest natural disasters in Genesee Valley History took place in June of 1972. A hurricane by the name of "Agnes" came ashore on the panhandle of Florida on June 19th, and moved north through Georgia and the Carolinas. She went back out to sea, recharged her energy and hit Southeastern New York State on June 22nd. Although Agnes was only a catagory 1 hurricane, she soon stalled over north-central Pennsylvania. Caught up in a slow moving low pressure system, the storm drifted slowly northeastward into New York State. 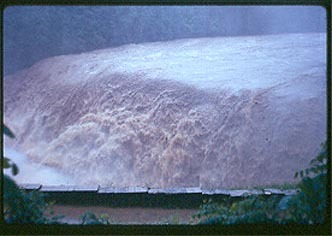 The area, that had already been soaked by showers the week before Agnes arrived, could not absorb the six to twelve inch rainfall that fell over Pennsylvania and New York. 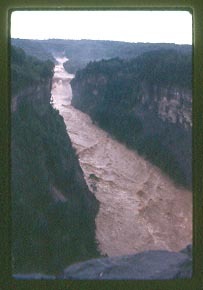 Known locally as "The Flood of '72", the event would have a tremendous impact on Western New York and Letchworth Park. 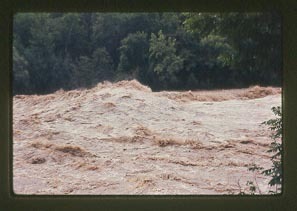 Don was busy with his police duties but Norma took her camera to capture the tremendous power of the raging flood waters. 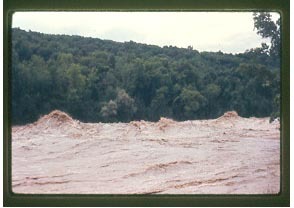 Over the next days she took many slides documenting the power of the flood in and around Letchworth Park. 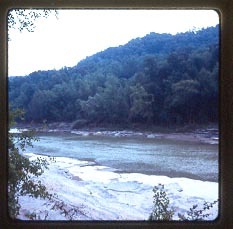 Unless noted, the following images come from the slides provided by the Gibson Family. They also provided us with much of the narrative and captions. 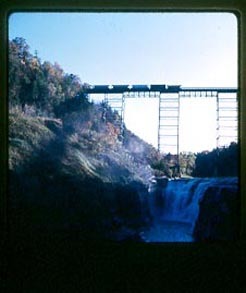 We are grateful to Don and Norma for sharing their photographs and memories with us. 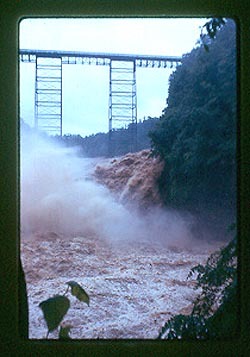 The Upper Falls and High Bridge at normal flow. 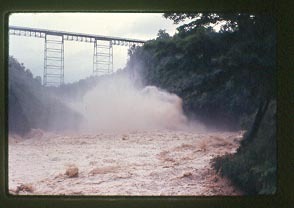 Above: The force of the water going over Upper Falls foams and sprays up to hide the Falls. 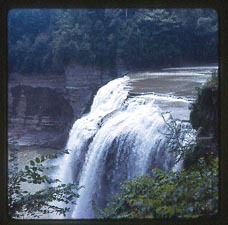 Right: On the 1st day the river below Upper Falls was so high that the normal 71 ' fall was cut in half. After the Flood a large amount of debris was revealed to have collected against the towers supporting the railroad bridge. Fast current creating some angry high waves. Standing on the bank you are actually looking up at the savage river and the creasting waves; can also hear rocks and boulders tumbing in the current before going over Middle Falls and feel a little vibration in the ground. Middle Falls from Inspiration Points shows the foam and spray rises to nearly the top of the 107' height of the Falls.